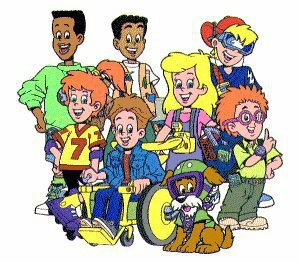 The '90s Zone: Super Inclusive!!! This was one of the things I remember most about the 90s: super inclusiveness. You will no joke see it in every cartoon stretching from the late 80s to early 2000s. The Burger King Kids Club thing above shows it perfectly. Srs. Look how inclusive that group is. You have a black kid, a hispanic, a hacker-type bad boy, a damsel in distress, a tomboy, a kid in a wheelchair, a nerd, and goddamn dog. I even bet the nerd has a dumb name like IT or something. These peripheral characters I'm certain were only there to show how inclusive it we all had to be. You probably could get rid of the hispanic kid and combine the dumb ginger nerd with the hacker. It's a cute kind of thing in retrospect but only in a laughable way. Oh 90s!